The opportunity to eliminate freight is a measurable and compelling reason to consider in-DC packaging operations. However, experience and history dictates that even with the elimination of freight, in-DC packaging operations do not always offer the most competitive solution. As a packaging expert who operate multiple in-DC and shared-facility packaging operations, we continually analyze these options when collaborating with our customers. Shared packaging operations run multiple customers at facilities that we own. Shared facilities spread the salaried and fixed overhead over multiple customers and higher volumes. Generally speaking, the higher volume shared facilities offer more automation, more flexibility and space to optimize line layouts. Lastly, the multiple customers in our shared facilities stabilize and balance the seasonality of work, ensuring that we are utilizing our assets throughout the year. This allows for better planning, consistent labor, increased efficiency, and the ability to manage spikes in demands more easily. In-DC operations eliminate transportation costs between DC and co-pack operations, having inventory on-site allow for immediate start of projects, and building costs can be removed from the co-pack price. 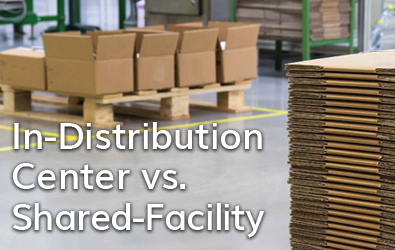 Unsure of what option is best for your company, or considering In-DC packaging operations? Call one of our packaging experts to learn more about which option might be best for you. © 2016 Visual Pak Companies. All Rights Reserved. Designed By Legend Creative.